Going hungry throughout the day is one of the most common mistakes made when trying to lose weight. You don’t need to eat less, you need to eat better; because keeping the body fully nourished is the most beneficial to our health. This keeps our energy and concentration at optimal levels to carry out our daily activities; but be careful, not any processed food is a good snack! So, before you run out to the vending machine or the nearest kiosk, we leave you with this list of the 10 healthiest snacks you can eat. Think that our body is like a machine, constantly burning energy and needing fuel to function in the best possible way. That’s why experts say that it’s necessary to eat at least one snack in the middle of the morning; and another in the middle of the afternoon – in addition to breakfast, lunch and dinner-. So start now! 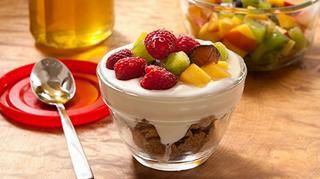 Take these healthy snack ideas, very easy and fast, and make them yourself to your needs! Nothing like eating cereal or fruit with a rich yogurt! Yogurt, like other dairy products, is an excellent source of calcium, magnesium and phosphorus, which are the most important minerals for our bones! However, some people prefer not to include it frequently in their diet due to its high intake of saturated fats; so the best option is to choose a low-fat or fat-free yogurt. Yogurt with a cereal rich in fiber such as oatmeal or granola, yogurt as a dressing for fruit salads, and especially, yogurt with almonds are excellent alternatives for healthy afternoon snacks; it will satisfy you enough and surely it will not exceed 200 calories! This option is not only one of the healthiest snacks you can eat; it’s also an excellent snack for adults to lose weight, burn fat and increase muscle mass, which will help you get a flat belly and defined abs. Protein shakes are delicious and refreshing; in addition, they will help reduce water retention, swelling and constipation that can prevent you from having a flat stomach. 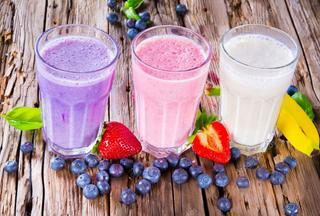 To drink a delicious protein shake, you can also add fruits, yogurt – which we talked about above -, among other healthy options; but remember that you should always combine proper nutrition with an exercise routine! 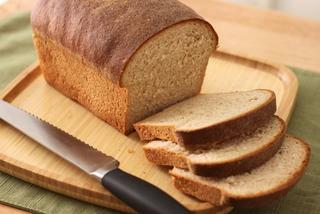 Whole-wheat toast can be great snacks if combined with other healthy ingredients. Besides, they are so simple and quick to prepare that they can also be excellent snacks for work, for meetings or at night. But not any sausage is a good alternative to eat healthy; whole-wheat toast should be prepared with ingredients such as tomato, avocado, fruit, light cheese and turkey. In this way, it will be a snack that gives you quality carbohydrates, fats and proteins, ideal to follow a balanced diet, take care of yourself or lose weight. Eggs, besides being an excellent option for breakfasts, are also one of the best healthy options you’ll find for afternoon snacks. 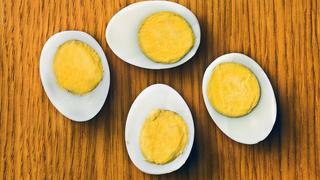 These are a great source of protein and vitamin D; and although some people think that eating eggs daily is dangerous, the truth is that if you eat a clean and balanced diet, egg yolks in moderation will not make you prone to heart problems. Prepare them boiled and combine them with other vegetables, so you can take them in a container anywhere and they will keep you satisfied! Now let’s talk about the puffed rice cakes. Besides being part of the healthiest snacks you can eat, puffed rice cakes are one of the most recommended snacks to keep you fit. This is because they are very low calorie snacks that provide carbohydrates and fibers. The list of ingredients is simple: brown rice and olive oil or salt, as long as they are natural. If you also add some cream such as peanut butter, and fruits such as bananas or strawberries, you will get a perfect snack: rich in protein and healthy fat. 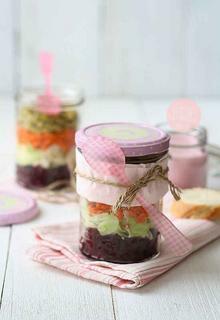 You can even use your creativity and make sandwiches with them and take them to your work! Eating in colors is healthier! 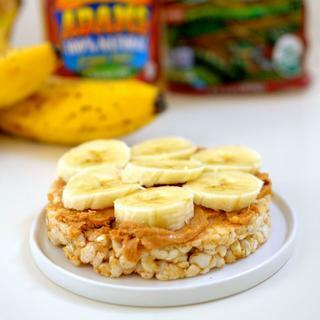 This is the best option to prepare your snack on a busy day; and it’s also an excellent snack for children, so that from a young age they learn the importance of a healthy diet. The basic colors of a colorful salad are: white, green, orange, yellow, red and violet; each group of color in specific combination of nutrients that help us to be better every day. You can even add yogurt to the salad to make it more delicious; it will be the recipe for happiness! 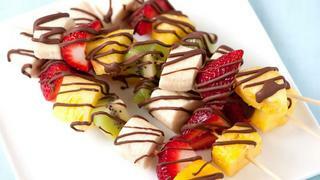 As we know, fruits are very important and cannot be out in our daily diet of colors! And to eat them as snacks, a very fun and simple option is to make fruit skewers, which provide carbohydrates, proteins and good fats. You can even dip them in peanut butter, sprinkle coconut and other nuts. Totally delicious! Of all fruits, apples are one of the healthiest snacks you can eat! Apples are rich in fiber, help with weight loss and there is a wide variety of healthy recipes you can make with them; to take to work, for children to take to school or simply to snack at some time of the day. 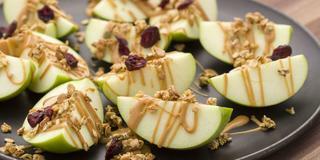 And if you don’t have much time, you can spread peanut butter to the apple or eat it on skewers; and that’s it! Your healthy snack will be ready. 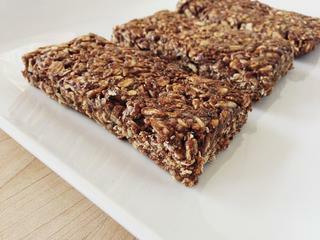 Of course, protein bars couldn’t be out of these top 10 healthiest snacks you can eat. These are an ideal option, especially if you have little time to prepare your snack; they are economical, healthy and you can take them anywhere – or even store them in your desk drawer-. But if you’re not careful, you may end up eating a candy disguised instead of a protein bar. So make sure you read their ingredients before buying them, and don’t eat too much, since many amounts can cause gastrointestinal problems. 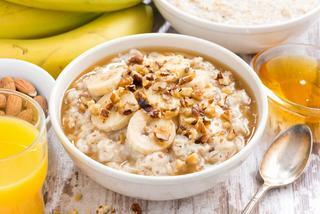 In the beginning of the article, we talked about oats as ideal accompaniments for Yogurt. But oatmeal itself is a very healthy food, which offers multiple benefits and with which you can prepare a variety of perfect snacks. Oats are rich in proteins, vitamins, fiber and minerals, ideal in the diet of both children and adults. Some delicious recipes are: Oatmeal with fruit and milk, oatmeal with yogurt, oatmeal cookies and oatmeal pancakes with peanut butter.